Over the past few weeks I have shared this news elsewhere, but now that the news has been shared with my current congregation, I want to share this here for those of you who follow my blog. On Sunday, May 4th, I was called as the new senior pastor of the Congregational Church in Exeter, a United Church of Christ congregation in New Hampshire. 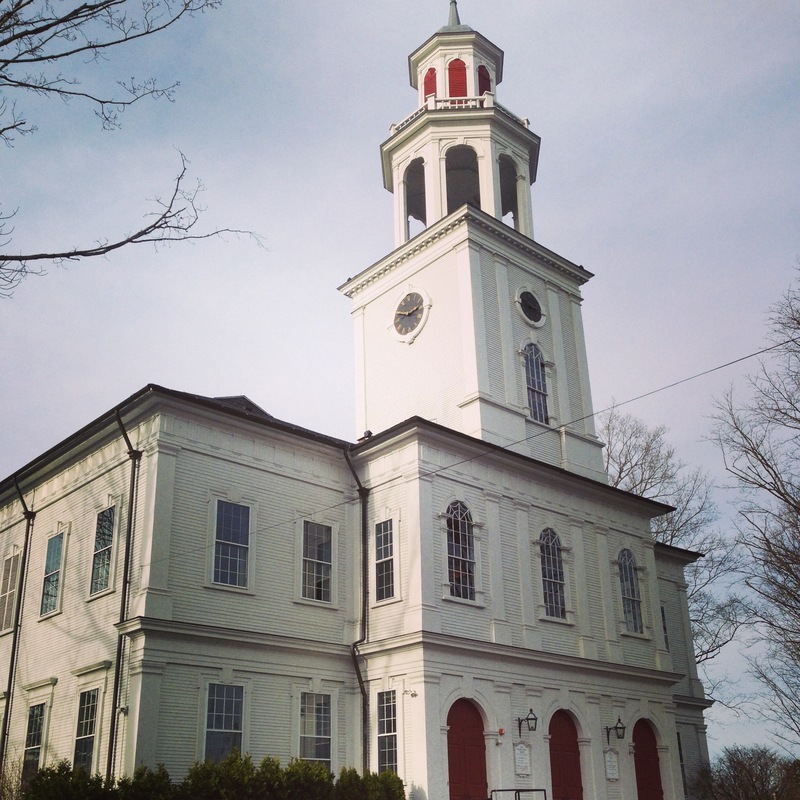 The Congregational Church in Exeter was founded 375 years ago, and has a rich history of witnessing to Christ’s love in southern New Hampshire. The congregation continues to be vital, and is an important contributor to the Exeter community. This, along with their Open and Affirming commitment, their Eco-Theology covenant, and more drew me to prayerfully consider this call. But it was my meetings with their search committee, and the deep faith and passion for a strong future for the church that they exhibited, that helped me to know that God was calling me Exeter. Heidi at her seminary graduation. Earlier this month my family had another celebration as well. 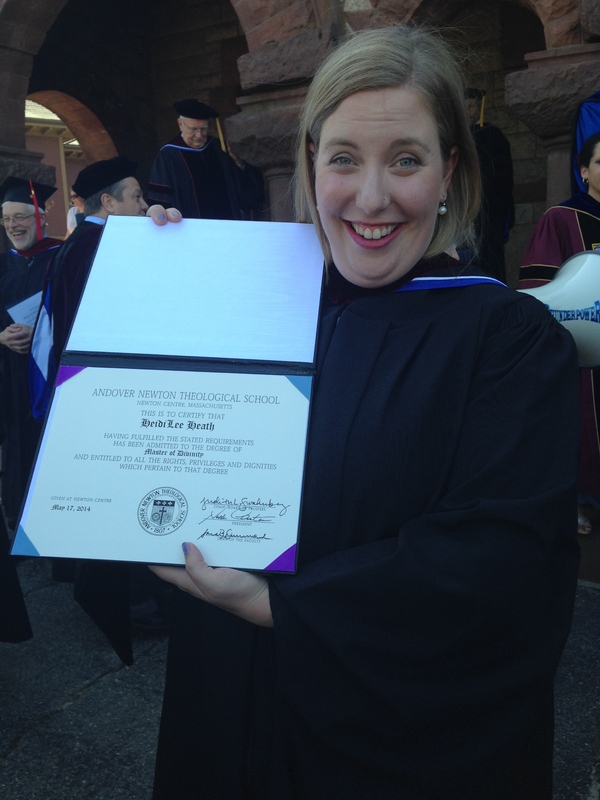 My wife, Heidi Carrington Heath, graduated with her Master of Divinity from Andover Newton Theological School. After years of coursework, internships, worship services, and ordination interviews, it was a day of profound joy and blessing. And it was also a day of commissioning. God has great things in mind for Heidi. I’ve known that since I met her. And now it will be my turn to stand beside her as she sees where God is calling to her next. My last day at West Dover Congregational Church will be June 22nd. We will be moving to Exeter the next day, and I will begin ministry at the Exeter church on July 15th. Heidi will be searching for her first ordainable call in the surrounding area as well. In all of this we have both felt extremely clear that we are being called together to make this step in faith, and we are confident of God’s grace. 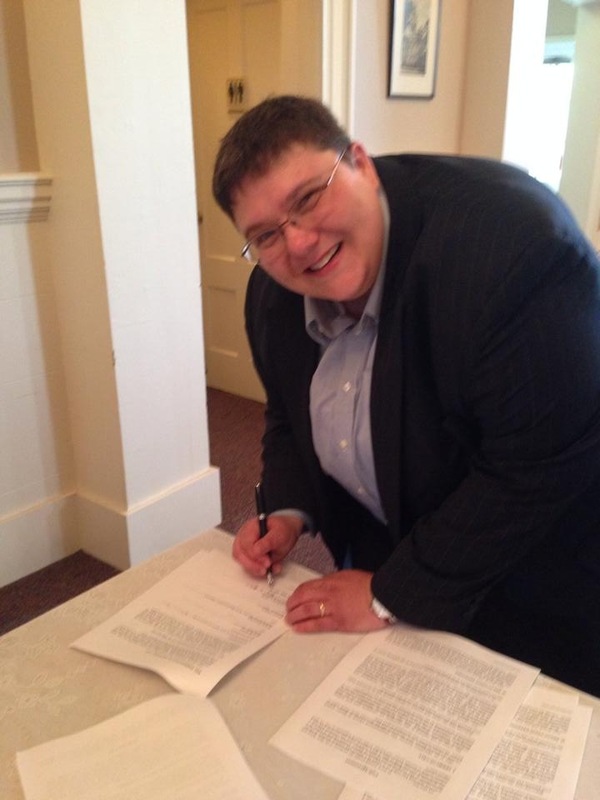 Signing the pastoral contract after the congregational vote. But to be clear, leaving is not easy. For the last four years I have been deeply blessed by the congregation of West Dover Congregational Church. In that time we have nearly doubled in size, we have had a successful Open and Affirming process, we have reached out further to our community, we have maintained the legacy of a sister church who closed, and we have undertaken major capital improvements. It has been an incredibly busy few years. But, more importantly, we have had moments together where I know that Christ was present, and where I know I saw God. But there comes a time for every pastor when they are called to something new. When that call came for my family it was indeed joyful, but there was plenty of bittersweet there too. We love Vermont, and we love our church. But we also know that God is calling us to the next step. And God is calling West Dover Congregational Church on to the next step too. And for the next part of the journey they will walk with someone else. And for the next part of my journey, I will walk with someone else too. And soon, I know Heidi will walk with a congregation on their journey as well. And God will be with all of us along the way. God be with you in your new calling and with Heidi as she searches for her calling. Congratulations to Heidi on her ordination and to you, Rev. Emily, on your new call! That church in Exeter will be lucky to get you! I hope you will continue to publish here as well!